Taking the lead at 38.9km when he passed Elijah Mutai, marathon debutant Tomoya Adachi won the 57th annual Beppu-Oita Marathon writes Ken Nakamura. It was the first debut win since Koichi Morishita's 1991 victory, after which he went on to become 1992 Olympic silver medalist. Adachi, only 22, has a 10000m best of 28:36 but was not even an invited runner. "Winning the race was not in my mind. I thought 'I am lucky' when I saw the leader coming back to me," said Adachi after the race. Sixteen runners, including pacemakers Stephen Chelimo and Elias Maindi, passed 10km in 30:29 and halfway in 1:04:47. Yoichi Watanabe fell at 17km, and Daniel Mwangi fell and lost his shoes just before halfway, but both soon rejoined the lead pack. After passing 25km (1:16:57), Chelimo and Maindi - picked up the pace, taking Elias Mutai five seconds clear as Adachi held back. The pacers dropped out at 30km (1:32:20), leaving Mutai in front with six runners - Scott Wescott, Rachid Kisri, Adachi, Takeyasu, Watanabe and Mwangi - chasing. At 35km Mutai was 38 seconds clear but a kilometre later Adachi set off in pursuit. He steadily closed the gap, and passed Mutai at 38.9km, followed by Wescott, who also passed Mutai. Kisri also passed the faltering Mutai to move into third. Mutai soon dropped out. Then a few hundred metres later, Kisri caught and passed Wescott to move into second. Ongori Philes of Kenya led from the start to finish and won the 62nd Marugame Half Marathon in the fastest time of the year writes Ken Nakamura. It was a personal best for her by nearly two minutes. She started fast, passing 5km in 15:33, only seven seconds slower than Kayoko Fukushi's record pace two years ago when setting an Asian record of 1:07:26. But for Philes, with a 5000m best of 14:50.15 last October, it was not an overly ambitious pace. She continued to push, covering the next 5km in 15:51. Although she fell further behind Fukushi's record pace the gap back to Ozaki and Hiroyama grew. Philes slowed further but continued to pull away as Harumi Hiroyama was left behind, leaving Yosimi Ozaki and Mari Ozaki (no relation) to fight it out for the runner-up spot. Philes won in the third fastest time on the course, behind Fukushi's 1:07:26 and Mizuki Noguchi's 1:07:43, both recorded two years ago. Philes is based in Japan and according to her coach: "We will think about moving up to the marathon after Beijing, perhaps after she runs a 1:06 half marathon." Harun Njoroge, Joseph Mwaniki and Martin Waweru, three young Kenyans who run for Japanese corporate track teams, dominated the men's race. A huge pack led by Kenyans covered 5km in 14:41 and 10km in 29:16. The pack reduced to about 10 runners when Mwaniki picked up the pace after 12km. Five Japanese were able to stay with three Kenyan leaders through 15km (43:58), but when the Kenyan trio surged, none of the Japanese could respond. The race was between Njoroge and Mwaniki after 20km, and at the entrance to the stadium, it was Njoroge who broke away from Mwaniki. Not yet 20, Njoroge is new on the Komori Corporation team. He has run 28:14.36 for 10000m and this was his first half marathon. Mwaniki, who runs for Konica-Minolta, is also 19 years old. Waweru, who turns 20 three days after the race, graduated from Aomori Yamada high school in Japan and now runs for Fujitsu. He ran 28:27.53 for the 10000m. The race was cancelled due to heavy snow. It needed two photo-finishes to separate seven athletes as Patrick Makau and Salina Kosgei snatched victories by the slightest of margins, winning $25000 each in the world's richest half marathon writes Pat Butcher. Only 15 years ago that Moses Tanui clocked 59:47 in the first ever sub-hour half marathon. Patrick Makau has now done it five times in 12 months, the first one coming when he finished second here in the inaugural race a year ago. There were still 10 men in contention at halfway, but that quickly reduced to five when Makau went to the front at 14km. The 21 year old Ethiopian debutant, Tsegaye Kebede took up the pace 3km later, and he and Makau went away from the others, swapping the lead through the last two kilometres. Makau had the edge in the final straight although the Ethiopian finished on the same time. In the three years since Makau began running seriously, he has established himself as one of the world's leaders at the half-marathon, underlining that with victory in Berlin nine months ago in his fastest yet, 58:56, and then finishing second in the world championships last October. Dickson Marwa of Tanzania had his best race ever, coming from behind to take third and beat his more famous compatriot, former world half-marathon champion Fabiano Joseph, although Joseph was rewarded with his first sub-60 clocking. The women's finish was even closer than the men's, with the leading trio crossing the line abreast, and the next pair just two seconds down. But the winner, Salina Kosgei, owed her victory to the lethargy of her rivals. The veteran Kosgei, a former 800m runner turned marathoner, had been dropped off the pack by 14km, but so gentle was the ensuing pace that she was able to claw back the deficit. She then dredged up some of that 800m speed from her memory bank, to outsprint her more fancied colleague, Pamela Chepchumba, and the Ethiopian Atsede Habtamu. All three were given the same time, the pedestrian early pace contributing to the relatively slow time, but also to the much-appreciated frantic finish. Cool (12°C) overcast and occasionally blustery weather and an improved course provided good enough conditions for the event record to be broken in the 28th edition. Philip Manyin and Christopher Rutto came onto the track for the final 300m with only a dozen metres or so separating them, but Manyin strode out to score a convincing win. Behind a leading group of eleven, mainly Kenyans, that broke away very early in the race the Spanish championship was fought out at a more moderate tempo. The lead group passed 10km in 30:28, already 50 seconds up on the leading Spanish runner. Apart from Maria Jose Bergua and last year's winner Zinas Alemu the women also held back from the early pace, three of them passing through 10km in 36:30. By halfway (1:05:14) little had changed for the men, but Bergua (1:15:30) was away by a margin of two minutes from Alemu, who was being pegged back by the group of three, including Sandra Ruales, who holds dual Ecuadorean and Spanish nationality. The men's group gradually splintered in the second half, with Manyin holding out for his narrow win, but Bergua went further and further ahead from the rest of the women while Ruales proved strongest of those chasing. Alemu faded slightly in the later stages while local runner Marta Ayora was delighted with her third place. 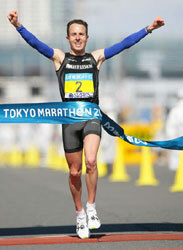 Viktor Röthlin, bronze medalist in the 2007 World Championships in Osaka, won the 2008 Tokyo Marathon in a new course record and a personal best - which surpassed his own Swiss record by nearly a minute writes Ken Nakamura. Röthlin was ecstatic, repeating "unbelievable" several times in his post-race interview but adding: "I think I am on the right track for Beijing." Two athletes both running their second marathons made huge improvements. Julius Gitahi, in third, improved by 8.5 minutes from his 2:17:26 debut last year and second-placed Arata Fujiwara improved on his 2:38:37 debut by half an hour. "Since the weather was good (sunny, 3°C, 42% humidity and little wind), I expected the pace to be fast" he said. "I decided to stay with the pace as long as I could." The Japanese favourite Toshinari Suwa, seventh in the 2004 Olympics, could manage only fourth, and second Japanese - dashing his hopes of again making the Olympic team. Defending champion Daniel Njenga slumped to 13th in 2:14:11. Jon Brown, Abel Kirui and Hailu Negussie all dropped out, while Samson Ramadhani finished in 2:18:47 and Eric Wainaina in 2:20:01. The race has yet to invite elite women runners so the winning time was modest. A total of 27,386 runners started the race, selected by lottery from 150,000 applicants. A lead pack of around 25 of them passed through 20km in 1:00:18. The real racing started after 25km as David Kemboi picked up the pace, reducing the lead pack to eleven runners at 27km. Kemboi dropped out at 30km, his pacing duties done, and Irifune made a move but then Röthlin surged. He reduced the lead pack to six runners, and by 33km had only Fujiwara and Gitahi for company. After passing 35km in 1:45:57, Röthlin stepped up a gear and a kilometre later was on his own. 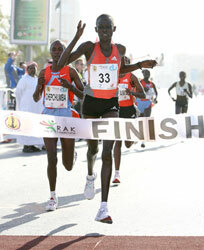 Fujiwara trailed him by 44 seconds at 40km and cramped in the final stages, but still held off Gitahi. As the first Japanese, with a sub-2:09 time, Fujiwara could win Olympic selection depending on what happens in the Lake Biwa Marathon on 2 March. With the race incorporating the 11th Asian Marathon Championships Kenyan dominance was finally broken in the men's race writes Elshadai Negash. Koichiro Fukuoka finished more than two minutes ahead of second placed Kenyan Cyprian Kiogora, who nonetheless led the Kenya to the team title in the final of the Greatest Race on Earth series. The women's race was closely fought between the North Korean duo of Kim Kum-ok and Jong Yong-ok right until the end. Rather than try to out sprint each other, the pair crossed the finish line together, holding hands. Although both were timed at 2:36:40 Kum-ok was credited with the victory. Anne Jepkemboi Kosgei of the Kenyan B team finished in fourth place to ensure her team's overall victory in the women's section of the Greatest Race on Earth series. Lornah Kiplagat defended her title for a fifth consecutive win, and sixth overall, by edging out Mestawet Tufa writes Dave Kuehls. In the men's race, a last minute gaffe by Silas Kipruto cost him the win and a sub-28 minute clocking. At 3km (9:06) Kiplagat led a line of seven contenders among whom were Turkey's Elvan Abeylegesse, Ethiopia's Elegayehu Dibaba and Tufa. The World Cross and World Road Running champion controlled the race from the front and gradually dropped the pretenders. At 5km (15:03) Kiplagat bounced along in her trademark orange socks but a woman a head shorter than her was not going away. Tufa stayed a step or two off Kiplagat's shoulder, out of sight but not out of mind. Coming off the bridge, Kiplagat had discarded her sunglasses and appeared under strain. Passing over a highway overpass at 8km (24:40) Kiplagat surged but the Ethiopian came right back to her. It seemed she was biding her time to make a decisive move. At 9km Kiplagat surged again. Tufa went to the front to cover, and then slowed so that Kiplagat almost crashed into her. Apparently energized by the incident Kiplagat bolted into a 10m lead. "She wanted to slow me down. I realised that she had no power anymore and I went by her," said Kiplagat, who did not slow down. In the men's race Deriba Merga, twice outkicked in very fast half marathon races last year, led from the gun and appeared to have the race in the bag until Kenya's Silas Kipruto made a furious charge. Kipruto went by Merga about 400m out and seemed assured of a win and a fast sub 28-minute clocking, when he followed a motorcycle to the wrong side of a fence. He soon realized his mistake and back-tracked to get on the right side, but by then it was too late. Merga was already past and away to take the win. Geoffrey Kiprotich became the first foreign winner besting defending champion and multi-titled local bet Eduardo Buenavista. They battled it out until 22km where the Kenyan surged ahead for a runaway win. The defending women's champion Jho-Ann Banayag successfully defended her title — her third — and towed compatriot Christabel Martes, herself a former champion, to the finish line. Kenyan Caroline Jeruto Kigen in third, and American Katie Fischer in sixth were the first foreign female runners to place highly in the event. This eighth edition of the race drew 1,105 registered runners in the marathon — more than ever before. Foreign runners came from Germany, Egypt, Australia, Singapore and Malaysia. There were also 920 runners in the 10km, 4,125 in the 5km and 422 in the 3km associated events. The race also featured a new route from Marikina City to Manila on streets and bridges along and across the Marikina, San Juan and Pasig rivers. The race has established itself as a highly anticipated event in the running calendar. It also helps keep alive the hope of a rehabilitated Pasig River, being organized by the Clean & Green Foundation and held on behalf of the Pasig River Rehabilitation Commission.